A web page listing provides details on four new PS Vita games, including an unannounced GTA title. UPDATE: Play.com has officially announced that the image supposedly revealing a new Grand Theft Auto title for the PSP Vita is actually a fake. In addition, listings for Tales of Innocence R and Final Fantasy Type-0 were also fabricated. The only genuine listing in the edited image was for Monster Hunter Portable 3, which has since been removed at the Capcom's request. 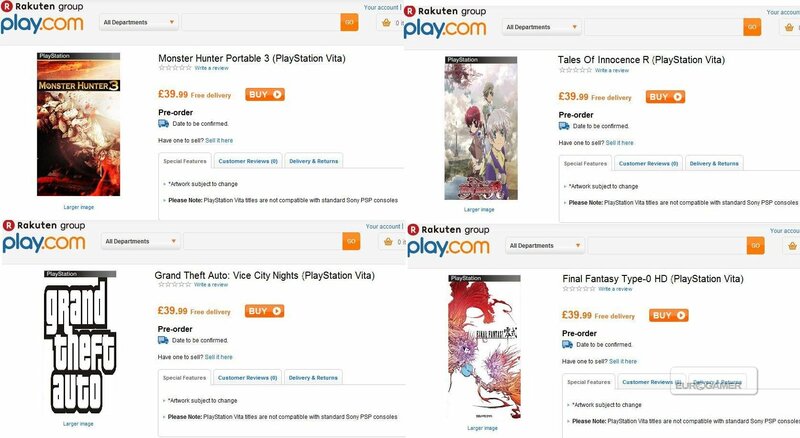 Online retailer Play.com let slip info on four new titles coming out for the PS Vita, including a new Grand Theft Auto game titled Vice City Nights. The new games may be related to Sony's upcoming "Welcome! PlayStation Vita Game Heaven" event being streamed live this Friday, March 9th at 8:00pm JST (or 6am EST) at the official Playstation website. Rockstar has previously created two games for the PSP, GTA: Liberty City Stories and GTA: Vice City Stories which were released in 2005 and 2006 respectively. It's not too far of a stretch to assume Rockstar may have been working on a new title the past few years specifically for the PS Vita. The other leaked titles, Final Fantasy Type-0, Monster Hunter Portable 3 and Tales of Innocence R, were previously released in Japan for the PSP over the past year, but their appearance on Play.com suggests that a western PS Vita release may be forthcoming. Play.com has since removed the entries for the games, but at the time of writing this post the page for Monter Hunter Portable 3 is still up and lists the game for pre-order.